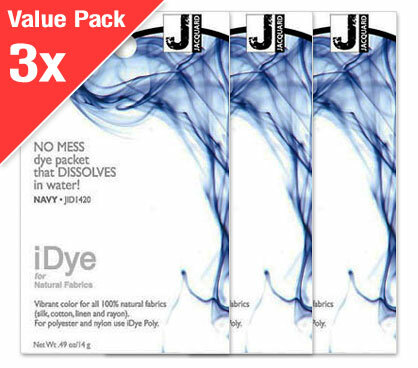 Dyeing has never been easier than with iDye from Jacquard! 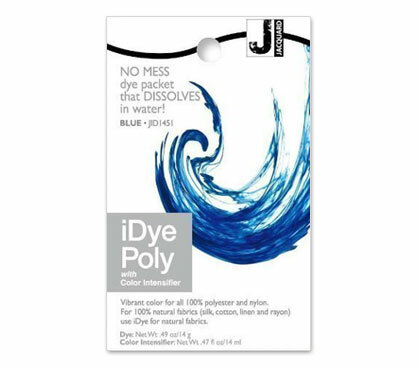 iDye comes in a dissolvable packet, so there are never any messy powders to handle: simply drop the packet into hot water or toss it in your washer! 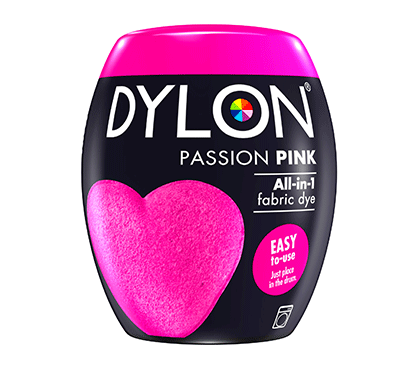 iDye is a hot water dye for any natural fabric that may be used on the stove-top or in the washing machine.The ultimate easy way to get gorgeous colour! Suitable for: 100% cotton, high% cotton mix, 100% linen, high% linen mix, poly-cotton mix, canvas, silk, rayon, viscose-natural fibre mix, hemp and more! Natural fabric and poly blends (for example, poly/cotton) may dye to a lighter shade or for deeper colour use iDye with iDye Poly. 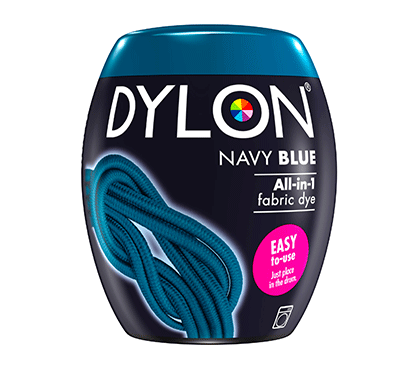 For 100% polyester & nylon use iDye Poly. One packet dyes 2 to 3 pounds (1 - 1.3 kg) of fabric. For cotton, linen and rayon add one cup (237 ml) of salt. For silk add a third of a cup (78 ml) of white vinegar instead of salt. For Polyester, Nylon and Poly/Cotton blends, dyeing on the stove top with 'iDye Poly' is easy too. For natural and synthetic blends, simply mix iDye with 'iDye Poly' and follow the stove top instructions provided on the packs! 1. Fill a stainless steel or enamel pot with just enough warm water for the fabric to move freely. Turn heat on medium. Remove fabric from water. 2. Add the iDye soluble dye packet to water and stir until fully dissolved. 3. Add pre-wetted fabric and raise temperature to a simmer, just below boiling. 4. For cotton, linen and rayon dissolve one cup (237 ml) of salt in a little hot water and add to dye bath. For silk and wool add a third of a cup (78 ml) of white vinegar instead of salt. Avoid pouring directly onto fabric. 5. Maintain simmer and stir frequently for ½ hour. 6. Turn off heat and allow the dye bath to return to room temperature, stirring occasionally. Rinse when cool enough to handle. Wear gloves as residual dye can stain skin. 7. Wash the fabric with a mild detergent in cool water and dry. 1. 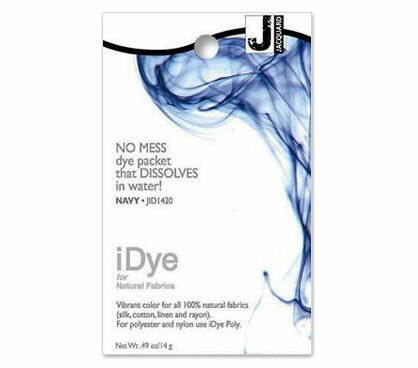 Dissolve the iDye soluble dye packet in approximately two cups of very hot water. 2. For cotton, linen and rayon dissolve one cup salt in approximately one quart of very hot water. 3. If you are dyeing silk you will use 1/3 cup of vinegar instead of salt. Do not use the washing machine method for wool because it will felt. 4. Pour the dissolved iDye and dissolved salt or vinegar into the bottom of the washing machine tub. 6. Set your machine for the hottest possible water temperature and longest possible wash cycle. If you are able to extend the wash cycle, do so. The longer you are able to allow the fabric to remain in the wash/dye cycle the darker the colour and the better the fixation. 7. When the machine has completed the wash cycle allow it to complete the balance of the wash/rinse/spin cycle. 8. Wash the garment with a mild detergent in cold water and dry. 1. 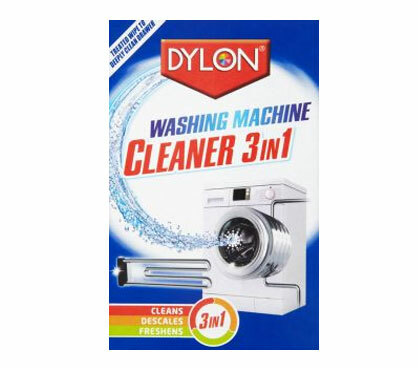 Fill washing machine with just enough very hot water for the fabric to move freely. 2. 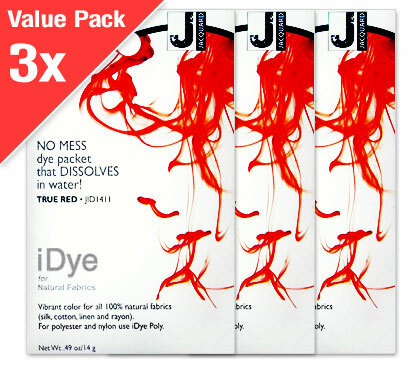 Add the iDye soluble dye packet. Agitate for 30 seconds longer until packet is dissolved. 3. For cotton, linen and rayon add one cup (237 ml) of salt. For silk add 1/3 cup (78 ml) of white vinegar instead of salt. Do not use the washing machine method for wool as it will felt. 5. Extend the dyeing time by resetting the wash cycle before the rinse cycle begins. The longer the dyeing time, the darker the colour and better the fixation. We recommend 50 to 60 minutes of dyeing time. 6. Allow the cycle to complete. 7. Wash the garment with a mild detergent in cold water and dry. 1. It’s not critical, as either the salt or the vinegar will work so just pick one. 2. Don’t add either, but use substantial heat in the dye bath (stovetop method). 3. Do two separate dyebaths, one with salt and one with vinegar. This will probably be best for darkest colours.